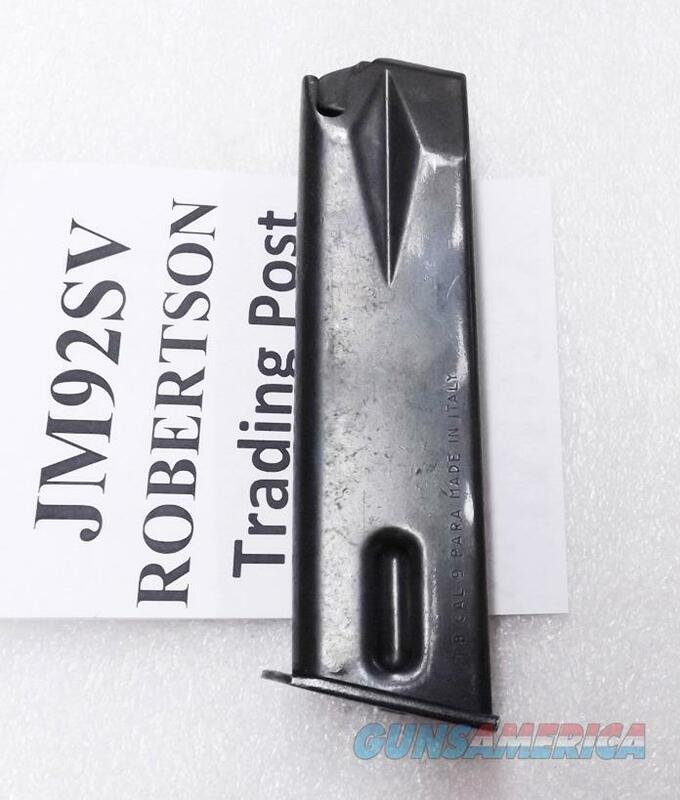 Description: Restrictions apply on high capacity magazines in several jurisdictions of the United States, so please read this entire ad carefully before offering to buy. Massachusetts buyers must hold a State Issued High Capacity Permit. This listing is for ONE magazine. From service with the Italian Carabinieri come these magazines for the Old Model 92S Beretta Pistol with European Magazine releases. Parent pistols were manufactured from 1977 until 1982, so they are well within the pre Ban period. Manufacturer was Pietro Beretta s.r.l. of Gussago, Italy. These were not imported by Beretta USA, and have never been to Accokeek, Maryland or to Gallatin, TN. Construction is one piece folded steel body, with full length welded back seam, steel spring, steel inner plate, steel floorplate, and with alloy cartridge follower. Each magazine holds 15 rounds of 9mm Luger caliber ammunition. Finish is polished surface laterals and plates, with smooth milled back. Back side has three perforations for round count. Surface detractions are moderate, principally case contact wear, and discoloration of the floorplate. We rate them as Very Good Condition, 75 to 80 percent vicinity by our estimate, but photos ought to suffice for our distinguished shoppers to judge finish grade for themselves. Spring strength is excellent, these have been unloaded for many years. We're offering them each	for only	$ 26.00. Not for sale to civilian residents of California, Connecticut, District of Colombia, Hawaii, Maryland, New Jersey, New York, or Vermont. Massachusetts buyers must furnish us a copy of your state issued High Capacity Permit.